This is the second in our series of posts that show you some of our favorite signs we’ve designed and mounted in specific cities around Santa Barbara County, and tell you a bit about the companies they represent. So, why the harp? Dargan’s Irish Pub, on Ortega between State and Anacapa, features live Irish music and dancing every week, along with specialty Irish food and drinks. This green projecting sign communicates both the traditional Irish feeling of the pub, and the fact that music is a big part of the culture offered to customers. Acura Santa Barbara is off the 101 near Hope Ave. displays two signs made by Dave Signs with familiar symbols, the Acura logo. We often take on projects for national companies, assembling and mounting these signs. This project included both a channel letter sign for the front of the dealership and a monument sign for the driveway’s end. Nothing says top investment firm quite like the simple, sans-serif lettering of the Morgan Stanley logo. These channel letters make the logo on the building look as simple and elegant as the logo on the page. With all modernized facilities, great prices, and a warm, welcoming atmosphere, Zen Massage Place chose a sign that captured exactly what they wanted to offer. A blade sign with a dark wood foundation and bright, provocative lettering captures attention and communicates the variety of services they offer. The shamrock says it all. The front-lit illuminated white sign pops because it is held within the black outline, which looks particularly eye-catching in the case of the apostrophe and the shamrock, which may have been lost otherwise. This pet hospital, located on Coast Village Circle, is a beautiful property with highly trained veterinarians who “offer a compassionate touch.” They are one of only 17% of veterinary facilities that are AAHA certified (The Standard of Veterinary Excellence), and they feature Dave’s signs around the property, including a wooden mounted sign and a post and panel sign, sometimes referred to as monument sign, for the end of the driveway. This beautiful Illuminated Channel Letter Sign turns an otherwise large generic building into clearly marked exercise destination. Clients driving down this busy Santa Barbara street can’t miss this Channel Letter Sign. A beautifuly illuminated Channel Letter Sign for the Santa Barbara Domino’s acts as a beacon to late night pizza cravers who opt to forgoe an all to easy pizza delivery and venture to aquire their pizza over the counter. 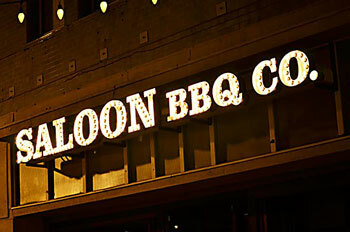 A popular hang out needs a good sign, it’s an iconic landmark of a warm place where friends flock on a Friday night.